No Littering. 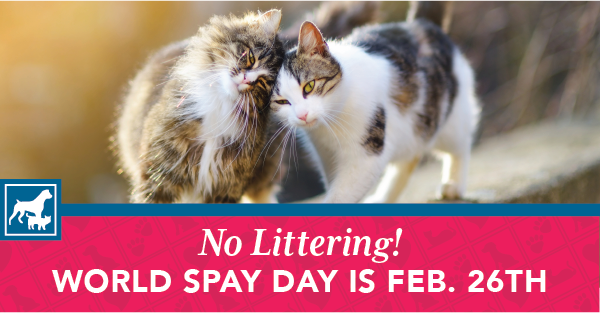 World Spay Day! These prices include anesthetic surgery, IV fluids, and post-operative pain medication. In addition to helping control the unwanted pet population, altering a pet will also eliminate unwanted behaviors like wandering and spraying. Health benefits include reducing the risk of uterine infections and some cancers. By the way: there’s no truth to the myth that a pet’s intelligence or ability to learn will be adversely affected by surgical sterilization. We’d be happy to answer any questions you may have about the spay/neuter process, surgery, risks, and health benefits. Just give us a call at 540-288-4683!